See below for complete list of Cairn Terrier characteristics! If you've seen the movie The Wizard of Oz, you've seen one of the most famous Cairn Terriers ever. The dog who played Toto in the film was a female Cairn named Terry. Paid $125 per week for her role as Toto, she was owned by trainer Carl Spitz, and she had appeared in several movies prior to her famous role in Oz. She lived to be 11 years old. The film character Toto is characteristically Cairn: a small, sturdy, shaggy-coated terrier who's highly intelligent and confident. The breed is alert and always ready for action. The Cairn is also curious and quick to learn. And, like all terriers, he's independent and a bit stubborn. He must know who is in charge, or he will take charge. Early obedience training and socialization are essential. In spite of his independent nature, the Cairn is a sensitive dog. His feelings are easily hurt, and he doesn't respond well to scolding or harsh corrections. Kind, positive training is the best method for teaching the Cairn. There is little this smart dog can't learn. With proper training, a Cairn can master an unlimited number of tricks and commands. However, it may be downright impossible to stop a Cairn from doing what Terriers love to do: chase (and dig and bark). 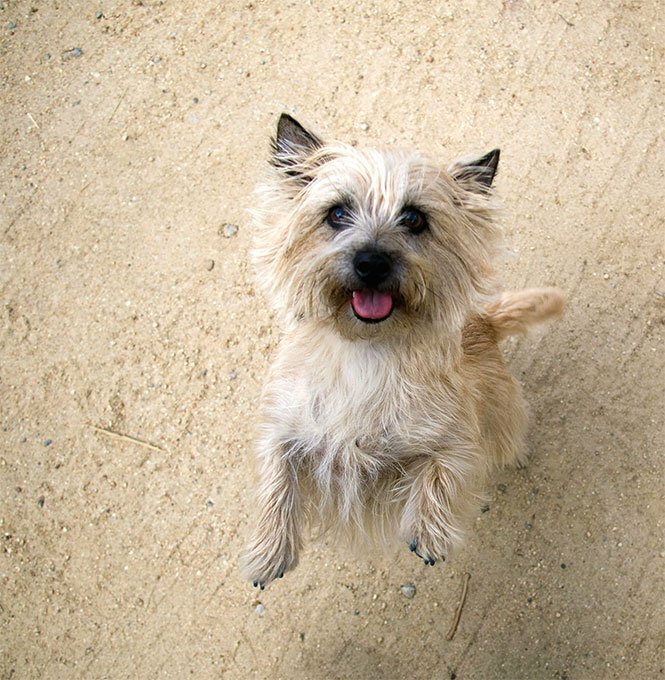 The Cairn will chase squirrels, cats, rabbits, and other dogs if given a chance. For this reason, he should only be walked in public places on a leash, and he should be given free run only in a securely fenced yard. The Cairn Terrier is a family dog, and he needs to live in the house (or apartment or condo) with his family. He thrives on attention from his loved ones, and he's unhappy if left alone too much. He can become bored at such times, which leads to destructive or annoying behaviors like barking, digging, or chewing. A Cairn Terrier is a wonderful family companion. He's fun and entertaining, loves to play with kids, and sounds the alarm when visitors approach. He is able to compete in obedience, agility, or Earthdog trials. A Cairn is a great pet for anyone who wants an independent, alert companion with a take-charge attitude toward life. The Cairn is a Terrier, which means his natural instincts are to bark, dig, and chase. These behaviors can be minimized with training, but they can't be eliminated. 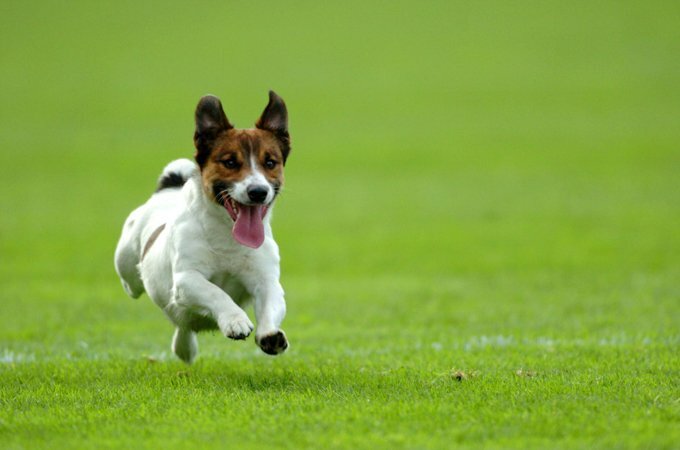 If you don't enjoy the typical terrier temperament, you should consider another breed. The Cairn is intelligent and curious. He also has a mind of his own. He will challenge your authority — good naturedly, of course — but you must be able to establish and maintain your role as pack leader, or he'll get the upper hand. The Cairn loves the attention of his family. Do not leave him alone for long periods of time or he may become destructive. The Cairn Terrier often thinks he's bigger than he actually is. Don't be surprised if he stands up for himself against large dogs or animals. Males stand 10 inches tall and weigh 14 pounds. Females stand 9.5 inches tall and weigh 13 pounds. The Cairn Terrier is a wonderfully friendly dog. He's happy and cheerful, and he seems to truly enjoy meeting people. He's also all terrier: independent, tough, and alert. Like any dog of the breed, he places digging, barking, and chasing high on his list of fun activities. He'll chase any small animal, including the neighbor's cat, if given a chance. He's a good watchdog, too, and will announce any visitor. Though independent, the Cairn is devoted to his family and is happiest when he's part of his owners' daily lives. He likes to be in the house, playing with the kids, following you room to room, joining you at the front door when you greet a friend. He's also known for being sensitive. He doesn't like to be scolded and is upset when you're not happy with him. Like every dog, the Cairn needs early socialization — exposure to many different people, sights, sounds, and experiences — when they're young. Socialization helps ensure that your Cairn puppy grows up to be a well-rounded dog. Cairns are generally healthy, but like all breeds, they're prone to certain health conditions. Not all Cairns will get any or all of these diseases, but it's important to be aware of them if you're considering this breed. In Cairns, you should expect to see health clearances from the Orthopedic Foundation for Animals (OFA) for hip dysplasia (with a score of fair or better), elbow dysplasia, hypothyroidism, and von Willebrand's disease; from Auburn University for thrombopathia; and from the Canine Eye Registry Foundation (CERF) certifying that eyes are normal. You can confirm health clearances by checking the OFA web site (offa.org). Craniomandibular Osteopathy: This affects the skull bones of a growing puppy, causing them to become irregularly enlarged. Symptoms usually appear between four and eight months of age. The cause is unknown but believed to be hereditary. Often the puppy's jaw and glands will become swollen, and he won't be able to open his mouth. He'll drool, have a fluctuating fever that recurs every couple of weeks, and, in some cases, his chewing muscles may atrophy. Anti-inflammatories and pain relievers help the dog deal with what is a painful condition. The irregular bone growth slows and typically stops by the time the puppy becomes a year old. The lesions can regress, but a few dogs have permanent jaw problems and therefore have trouble eating. Occasional cases are severe enough to call for jaw surgery. Cryptorchidism: Cryptorchidism is the failure of one or both of the testicles to descend into the scrotum. Testicles should descend fully by the time the puppy is two months old. If a testicle is retained, it is usually nonfunctional and can become cancerous if not removed. Treatment is surgical neutering. Globoid Cell Leukodystrophy: Also known as Krabbe's disease, this is a degenerative disease of the white matter of the brain and spinal cord. Affected puppies die at a very early age or are euthanized. There is now a test available that can identify carriers of this disease. Breeding dogs should be tested. Legg-Calve-Perthes Disease: This affliction involves the hip joint. If your Cairn has Legg-Perthes, the blood supply to the head of the femur (the large rear leg bone) is decreased, and the head of the femur that connects to the pelvis begins to disintegrate. The first symptoms, limping and atrophy of the leg muscle, usually occur when puppies are four to six months old. Surgery can correct the condition, usually resulting in a pain-free puppy. Ocular Melanosis/Secondary Glaucoma: Formerly called pigmentary glaucoma, this is a fairly recent development in the United States (since 1984). It is a painful inherited condition that occurs primarily in Cairns between seven and 12 years old. The condition generally affects both eyes. Watch both eyes for small spots or patches of very dark pigmentation within the sclera (white part of the eye). The pigment deposits accumulate and decrease ability of fluid to drain out of the anterior chamber. This leads to increased pressure, which is known as secondary glaucoma. If diagnosed early, the condition can be controlled with medication. Portosystemic Liver Shunt: This is a congenital abnormality in which blood vessels allow blood to bypass the liver. As a result, the blood is not cleansed by the liver as it should be. Surgery is usually the best option. Caring for a Cairn Terrier isn't difficult. Because of his small size, he's a good dog for apartment dwellers, but he's also hardy enough to enjoy ranch life. He must have sufficient exercise and activity, however. A long daily walk or vigorous play for 20 to 30 minutes will help keep him healthy and alert. Despite the fact that he's a quick study, remember that the Cairn also has a stubborn streak. Regular obedience training (beginning with puppy classes) is essential to teach him good manners and respect for your authority. Don't be surprised if he challenges you — just keep training. Be positive, kind, and consistent. A "quiet" command should be one of your Cairn's basics. Don't let him off-leash in public places; he's likely to give in to any temptation to chase. And don't give him unsupervised free time in the yard. He'll dig, and he doesn't care whether he excavates a secluded area by the fence or your lovely new flower garden. Keep your Cairn in good shape by measuring his food and feeding him twice a day rather than leaving food out all the time. If you're unsure whether he's overweight, give him the eye test and the hands-on test. For more on feeding your Cairn, see our guidelines for buying the right food, feeding your puppy, and feeding your adult dog. The scruffy-looking Cairn Terrier has a double coat: a wiry outer coat and soft undercoat. The coat comes in many colors, including red, brindle, black, sand, and gray. This coat is easy to groom. A thorough brushing once a week is sufficient, as is periodic bathing (every three months or so, or as needed). Frequent bathing isn't recommended because it softens the coarse terrier coat. 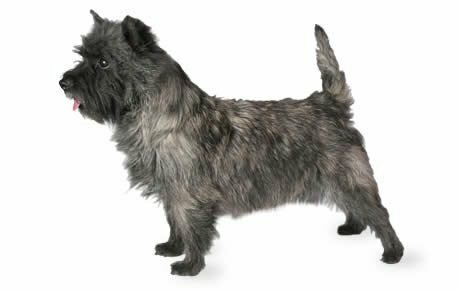 While a soft coat isn't harmful to any dog, and is fine for a pet, it does detract from a show Cairn's physical appearance. Some trimming is necessary for the Cairn — mostly to tidy his look, not radically style his locks. If he's to be a show dog, his coat isn't trimmed with clippers (as is the Poodle's coat, for example), but shortened or shaped by stripping with a stripping knife. Stripping isn't really necessary for a family pet, however; a professional trim with clippers two to three times a year is fine (though be aware that this practice softens the breed's naturally coarse coat). Brush your Cairn's teeth at least two or three times a week to remove tartar buildup and the bacteria that lurk inside it. Daily brushing is even better if you want to prevent gum disease and bad breath. Begin accustoming your Cairn to being brushed and examined when he's a puppy. Handle his paws frequently — dogs are touchy about their feet — and look inside his mouth. Make grooming a positive experience filled with praise and rewards, and you'll lay the groundwork for easy veterinary exams and other handling when he's an adult. The Cairn Terrier loves kids and is highly tolerant of them. In fact, he enjoys the noise and commotion that goes along with children. As for other pets, a properly socialized and trained Cairn tends to get along with and respect those in the household. He's apt to chase any other animal that comes into his yard, however. Cairns are often purchased without any clear understanding of what goes into owning one. There are many Cairns in need of adoption and or fostering. There are a number of rescues that we have not listed. If you don't see a rescue listed for your area, contact the national breed club or a local breed club and they can point you toward a Cairn rescue. Below are breed clubs, organizations, and associations where you can find additional information about the Cairns.